Five ways large organisations can go beyond collaboration and help local communities, people of color and others build lasting power for change. 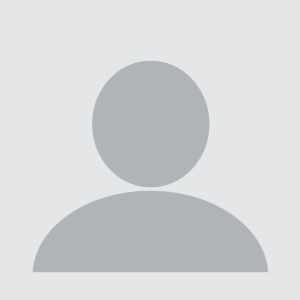 Marce Gutiérrez-Graudiņš doesn’t view questions of equity, fairness and privilege as hypotheticals. She was often the only person of color in rooms of people working on sustainable fishing issues in southern California. There she was asked to represent large and diverse communities while dealing head on with issues of inequality, privilege and even racism in collaborations with large state and national organisations. Change (e.g. cleaning up a river, closing a toxic power plant or sustainable fishing rules) most often comes from collaborative organizing efforts. And while this work may be successful in meeting important short-term goals, local citizens are often left without the economic and political power to take on systemic problems that created pollution or put their community in harms way. Resource Media, a US-based nonprofit public relations firm, hopes advocates reimagine how they work with local communities and people of color to address inequality and build lasting, broad-based power. Gutiérrez-Graudiņš and Resource Media started La Madre Tierra in 2013 to analyze and test what works and what doesn’t in working relationships between Latinos and conservationists in the western United States. Their findings were profiled in The Verde Paper: Latino Perspectives of Conservation Leadership. 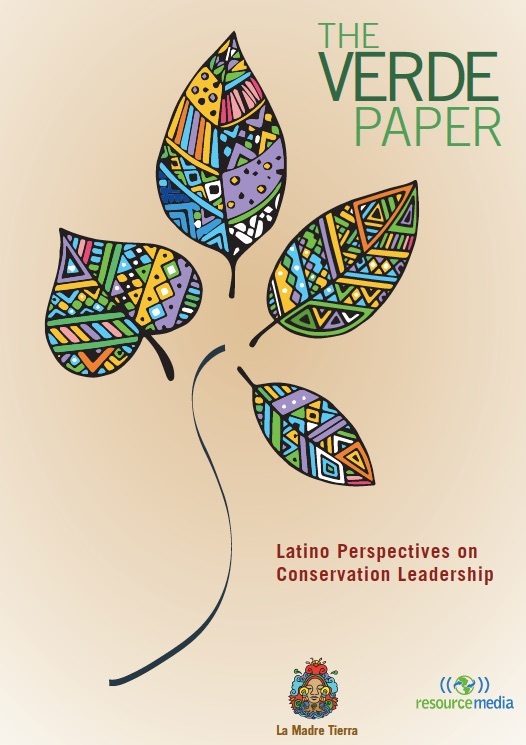 The Verde Paper explores collaboration and power through campaign case studies and findings from dozens of interviews with Latino conservationists. We talked to Gutiérrez-Graudiņš, a Resource Media partner and founder/director of Azul, about what campaigners and leaders can learn from how activists and conservationists approached collaboration in campaigns against coal power and for renewable energy last year. California’s coastal communities often evoke images of beaches, oceans and wealth. But people in Oxnard, on southern California’s coast, have a different perspective that includes fossil fuel power plants and pollution. Three power plants line Oxnard’s coast. 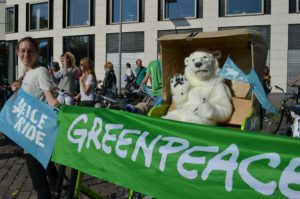 Locals have been mobilising against a fourth power plant—many carrying messages about impacts on climate change and renewable energy alternatives that are typically heard from larger environmental organizations. Create social capital: Don’t approach collaboration as a zero-sum game. Every action should create resources for all involved, not use them up. Listen: It isn’t about you, your organisation or even your policy goals. Listen to people, talk about shared values and then act. Use creative, hands-on training: Strela Cervas of CEJA describes using shoeboxes and legos to help people envision their future community. Give people new ways to learn. Integrate and respect stories: The stories of those most impacted can build their strength, not just help you win. Collaborate from the start: Be on the ground and in communities early. Be invested in local power. 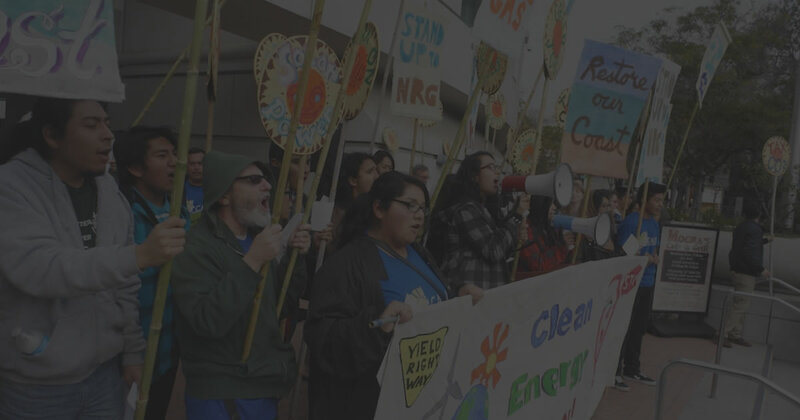 The battle over siting of another power plant in Oxnard is an example of collaboration between local people, many poor and people of color, and larger environmental justice organizations. The collaboration eventually led to more powerful work to address root issues through passage of SB350, a California law to double the state’s energy efficiency goals and increase renewable energy production. 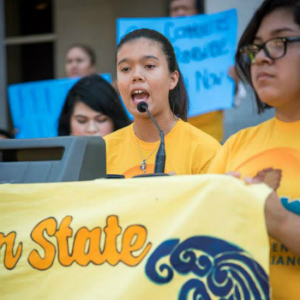 With the push for SB350 came a determination among those communities to fight back against the pollution and health hazards (such as rocketing asthma and cancer rates) they viewed as being directly linked to their city’s (and state’s) reliance on fossil fuel. Lucas Zucker, policy and communications director for Central Coast Alliance United for a Sustainable Economy (CAUSE), viewed SB350 as a path to more effectively fighting a fourth Oxnard power plant. “The state passing SB350 completely changed the economic calculus for whether another fossil fuel power plant even makes sense in this region, or whether it should be renewables,” he said. CAUSE was part of the larger statewide coalition that worked with the first Latino Senate President Pro Tem Kevin de Leon to lobby for the passage of SB350. Zucker views the advocacy around SB350 as a turning point for California’s environmental movement: what had been a white, upper middle class movement focusing on biodiversity and land conservation is now advocating around a range of justice issues that together have put low income and minority communities on the frontlines of pollution exposure. According to Zucker, the work on SB350 is a model for collaboration from the start rather than calling on people when a “local voice” is needed. “As soon as oil companies start doing their outreach and persuasion in communities of color, then environmental organizations realize, ‘oh wait, we got to get these guys on board,’ rather than being together as a united front from the beginning,” said Zucker. CAUSE took a different approach with SB350 by listening to and being present in communities early on. What does that look like? According to Zucker, community activists from low income areas assessed issues, interviewed local representatives, made endorsements and knocked on the doors in their own neighborhoods. 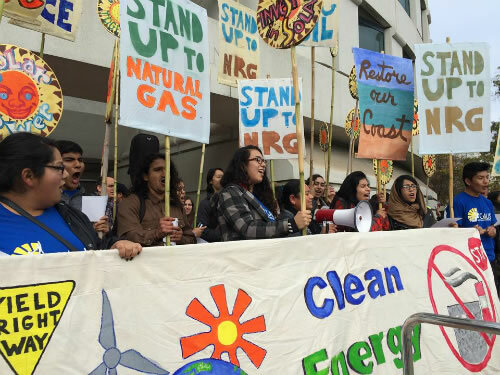 Central Coast Alliance United for a Sustainable Economy rally in front of the California Public Utilities Commission in San Francisco on December 17th, 2015. 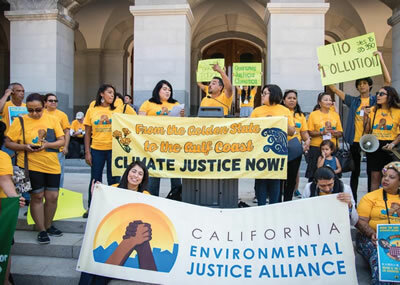 Strela Cervas, co-director of the California Environmental Justice Alliance (CEJA), stressed the need for community members to understand and articulate what they want in policy form. Cervas and her team began to work with the community using a hands-on, creative approach—they created a mini city made out of shoe boxes and legos. They took a look at how energy is produced, what it means to have dirty energy, where that dirty energy comes from, and what it means to have clean energy in the local community. Smoke stacks, transmission lines, and power plants made up this pretend city and allowed community members to rethink their own communities. CEJA Congresso gathering at the California state capitol in Sacramento. Photo by Brooke Anderson via CEJA. Similar types of trainings took place throughout the state surrounding SB350. All the components of the bill were covered (and done so visually) so that community members had a chance to see what those policies would actually look like on the ground. Elma DelAguila, a 17-year-old junior at Channel Islands High School, lobbied against a fourth power plant along Oxnard’s coast. With CAUSE she began a mission of informing her community members about the health risks associated with a new power plant. Elma Del Aguila speaks at at the Califonia state capitol during a 2015 CEJA Congresso. With the passage of SB350 comes an important lesson: true collaboration is key to the empowerment of low income and communities of color that live among some of the worst environmental hazards. These collaborative relationships take time but organizations in California and elsewhere are finding them key paths to both environmental sustainability and sustaining change.